Considered the best coffee-infused premium cigars offered on the market today. Rocky Patel Java Maduro are constructed as box-pressed infused with complexed mixtures of Nicaraguan binders and long-filler tobaccos packed inside a dark and oily chocolate-brown Brazilian Mata Fina wrapper. 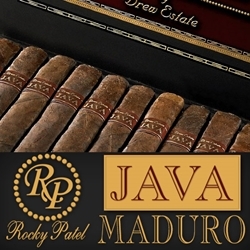 Throughout this elegant smoking experience, Rocky Patel Java Maduro offers flavors of mocha and coffee with hints of dark chocolate, expresso and rich notes of earthly delights. Coffee and cigars make a great match, Rocky Patel Java Maduro offers an enjoyable way to relax with a hot mug and a fine hand-rolled premium cigar. Smokers Discounts believes you'll really enjoy Rocky Patel Java Maduro cigars. We’ve made it easy and affordable to buy cigars online. A variety of sizes and flavors are listed below in our online cigar store. Each of these styles are in stock and available today for a low discount price. Call us for more details!